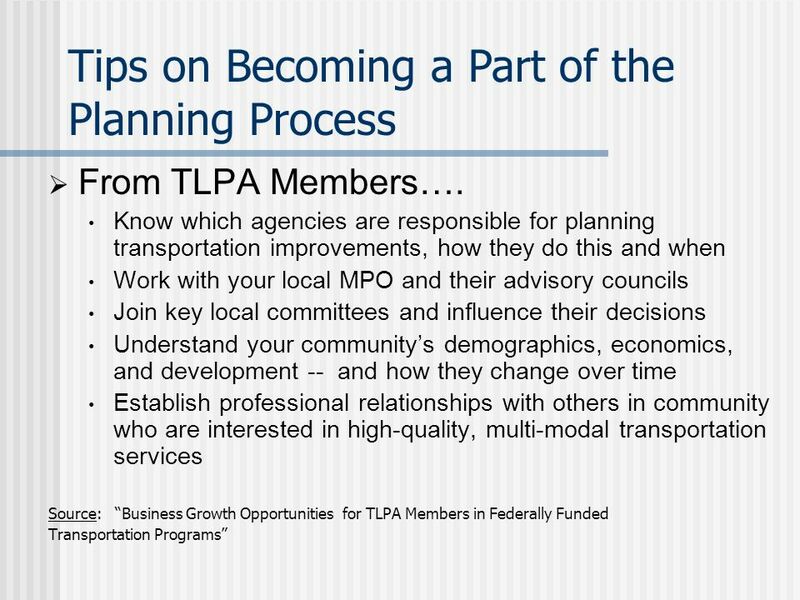 Contracting and Business Opportunities with Transportation Planning American Bus Association 2010 Marketplace Hal Morgan, Taxicab Limousine & Paratransit. 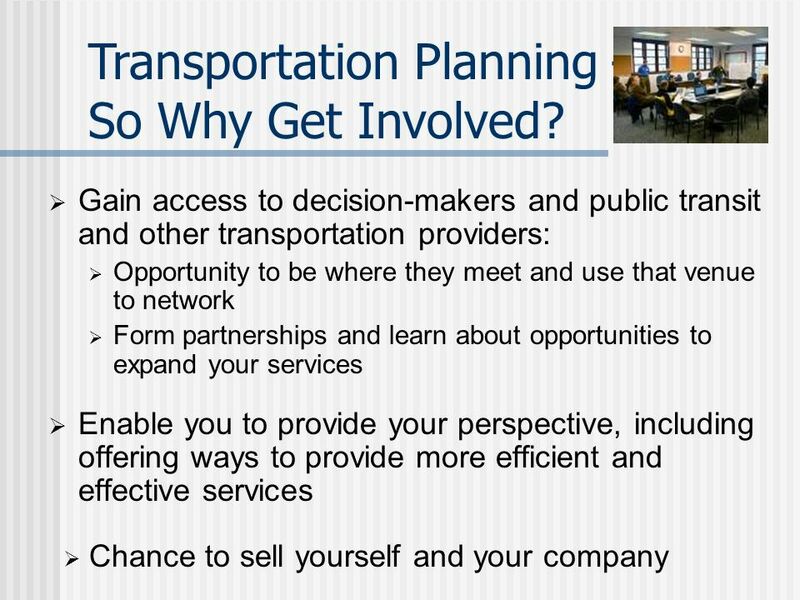 5 Gain access to decision-makers and public transit and other transportation providers: Opportunity to be where they meet and use that venue to network Form partnerships and learn about opportunities to expand your services Enable you to provide your perspective, including offering ways to provide more efficient and effective services Chance to sell yourself and your company Transportation Planning – So Why Get Involved? 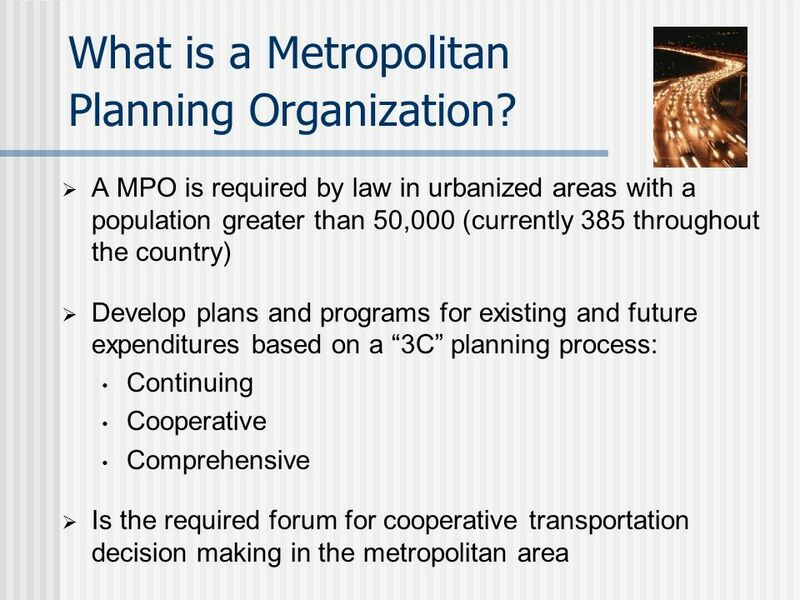 11 A MPO is required by law in urbanized areas with a population greater than 50,000 (currently 385 throughout the country) Develop plans and programs for existing and future expenditures based on a 3C planning process: Continuing Cooperative Comprehensive Is the required forum for cooperative transportation decision making in the metropolitan area What is a Metropolitan Planning Organization? 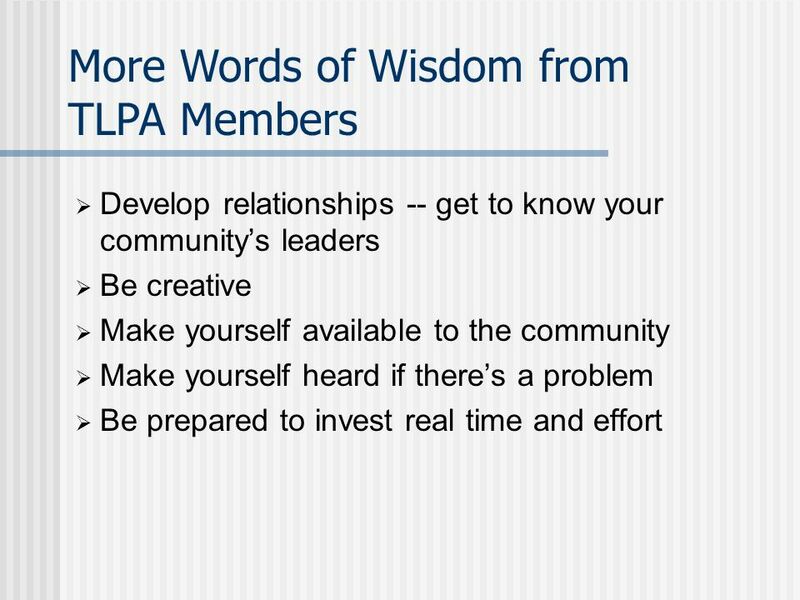 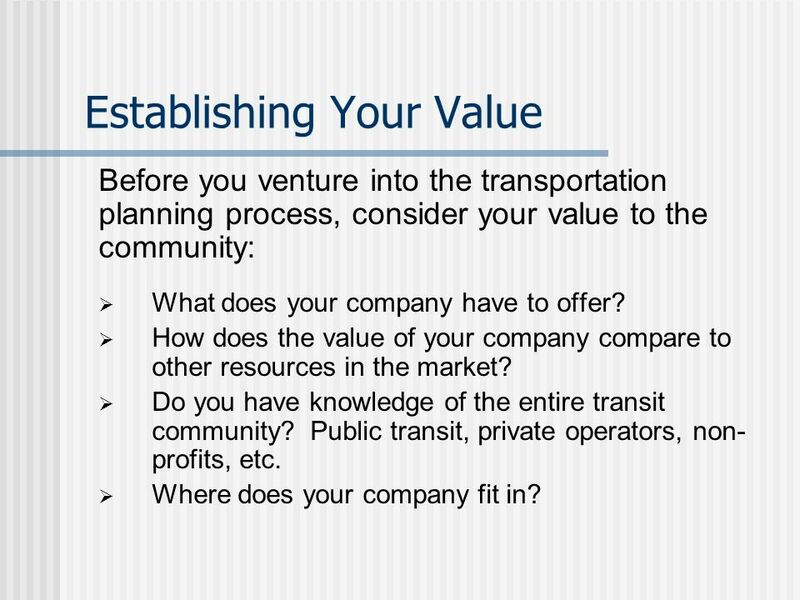 24 Establishing Your Value Before you venture into the transportation planning process, consider your value to the community: What does your company have to offer? 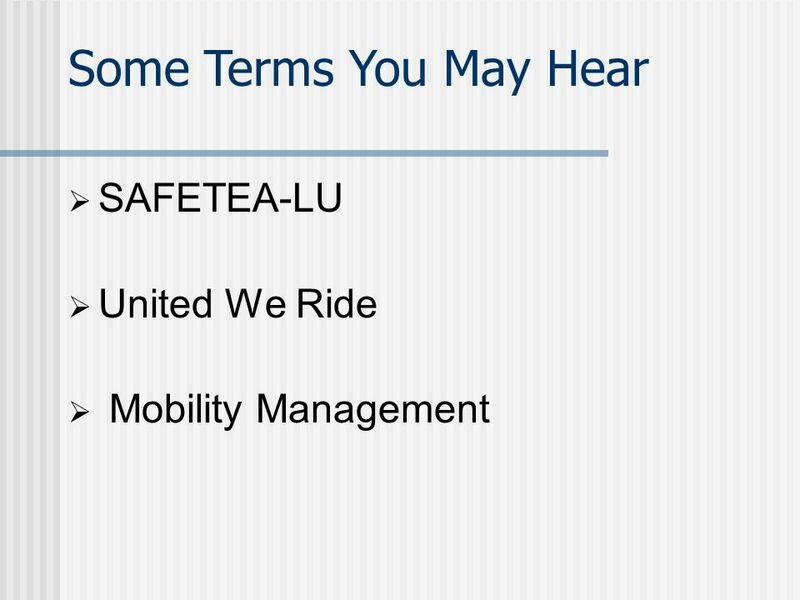 How does the value of your company compare to other resources in the market? 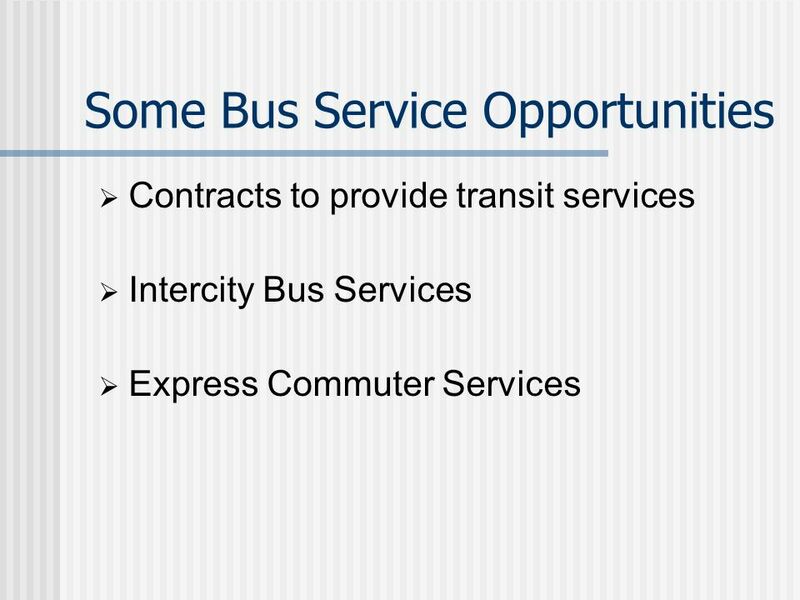 Do you have knowledge of the entire transit community? 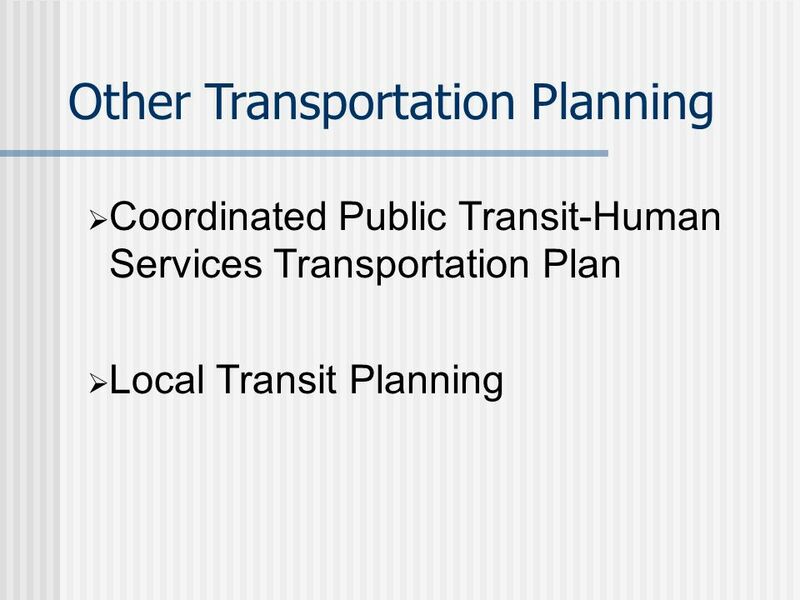 Public transit, private operators, non- profits, etc. 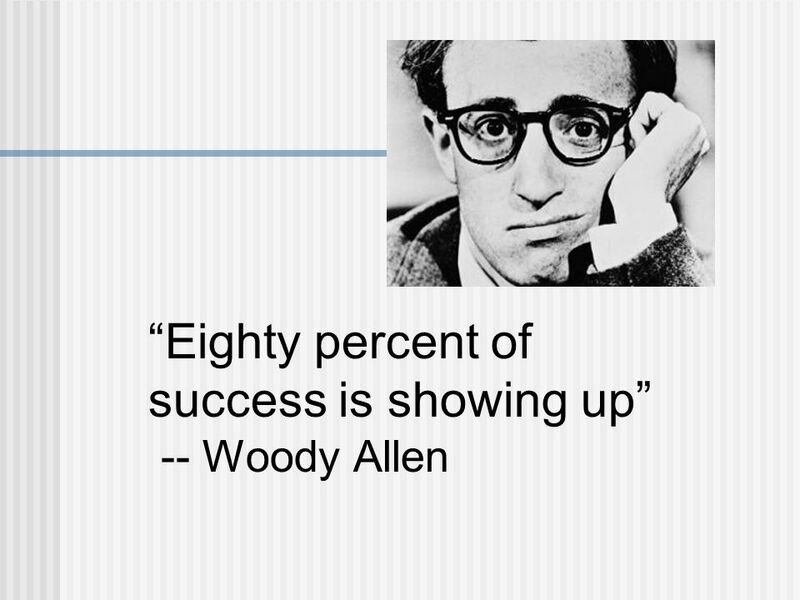 Where does your company fit in? 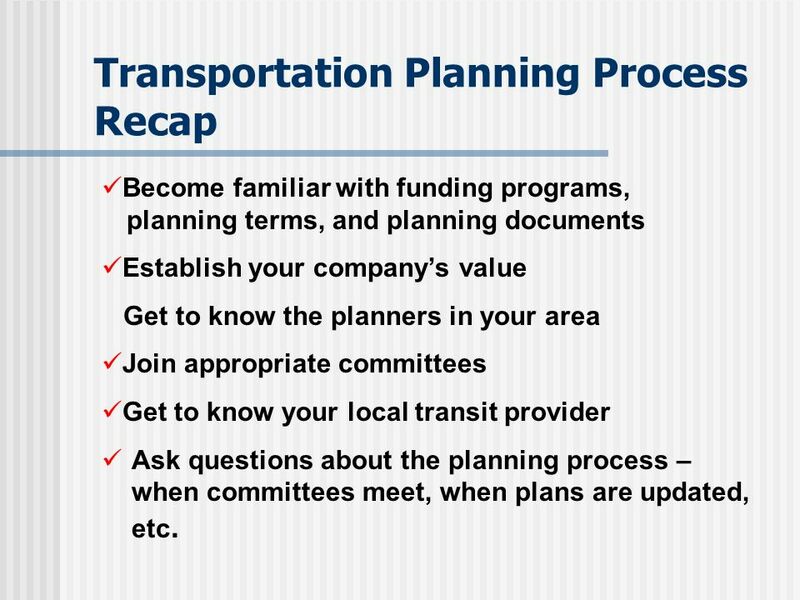 25 Transportation Planning Process Recap Become familiar with funding programs, planning terms, and planning documents Establish your companys value Get to know the planners in your area Join appropriate committees Get to know your local transit provider Ask questions about the planning process – when committees meet, when plans are updated, etc. 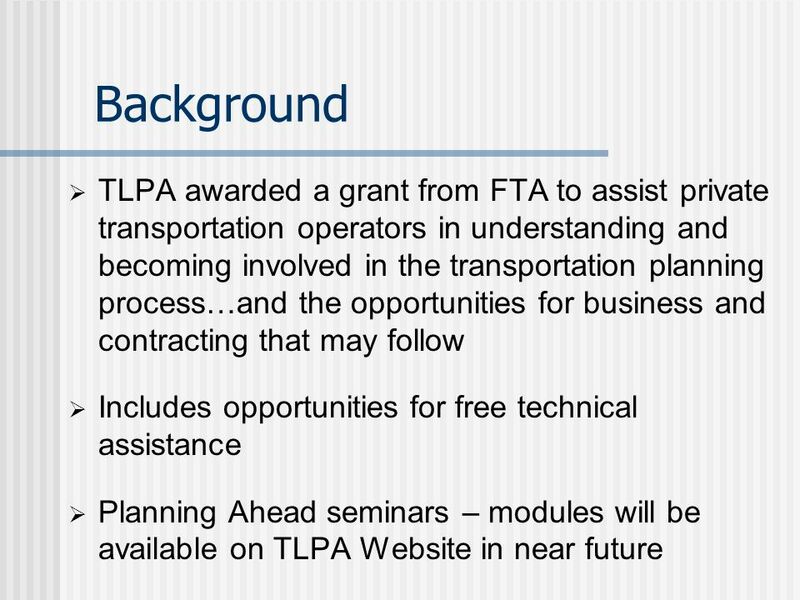 Download ppt "Contracting and Business Opportunities with Transportation Planning American Bus Association 2010 Marketplace Hal Morgan, Taxicab Limousine & Paratransit." 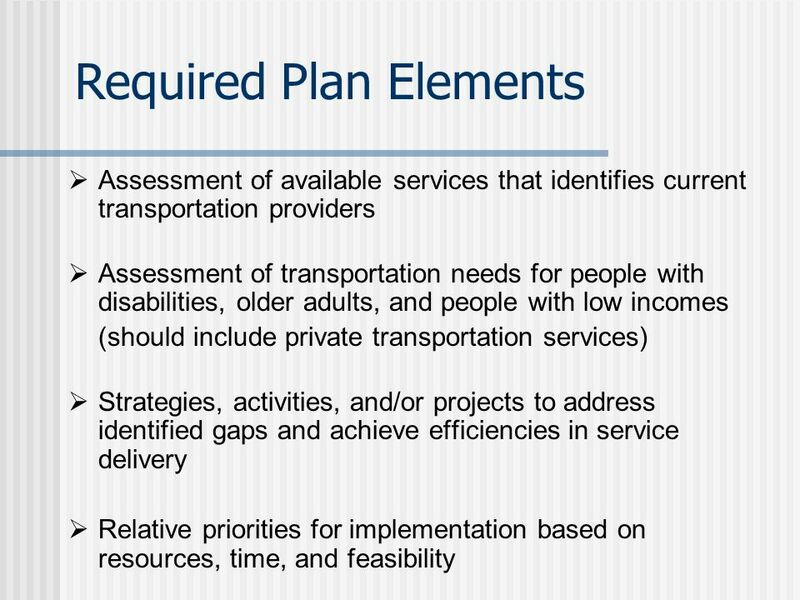 Human Service Transportation Plan UPDATE Illinois Department of Transportations Division of Public and Intermodal Transportation: Downstate (Rural) Area. 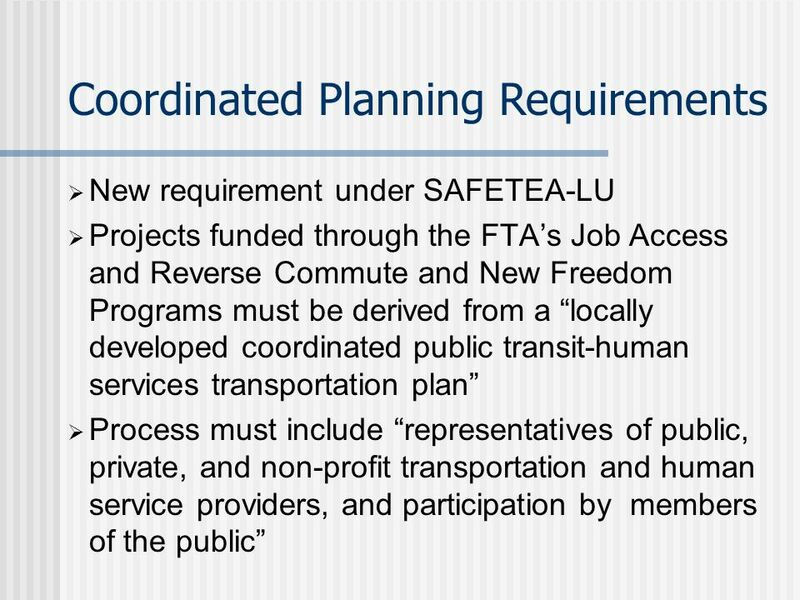 SECTIONS 5310, 5316 AND 5317 PROGRAM GUIDELINES AND REQUIREMENTS The Governor of South Carolina has designated the South Carolina Department of Transportations. 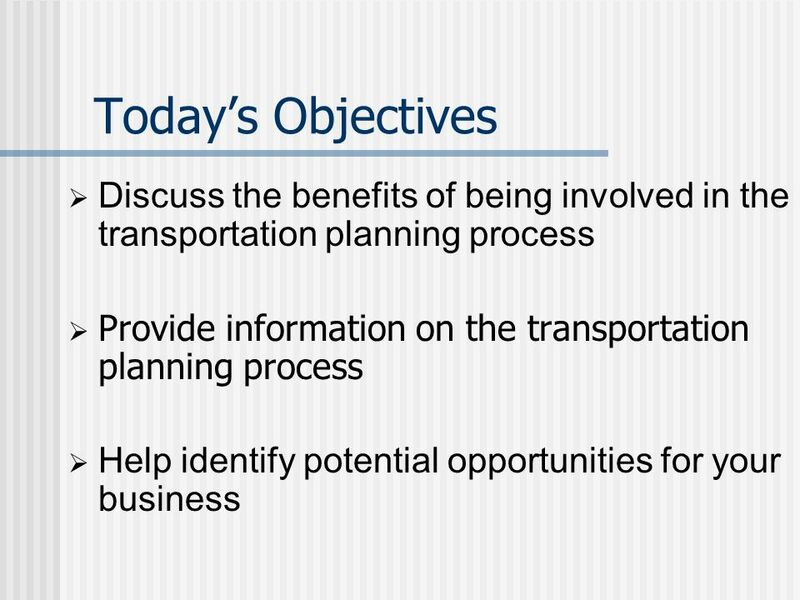 Ohio Department of Transportation Office of Transit Locally Develop Plan Development Workshop Wednesday, March 19, 2008. 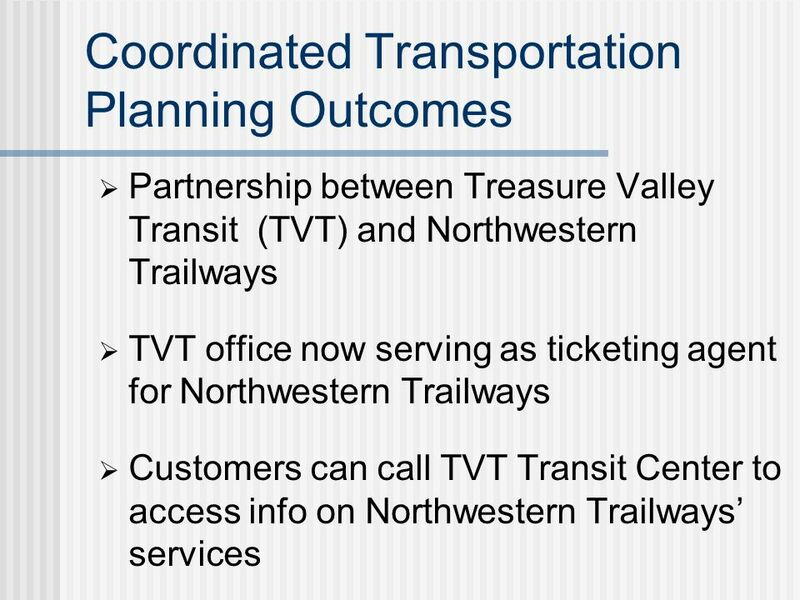 Greater Minnesota Transit Investment Plan PAC December 14, 2010. 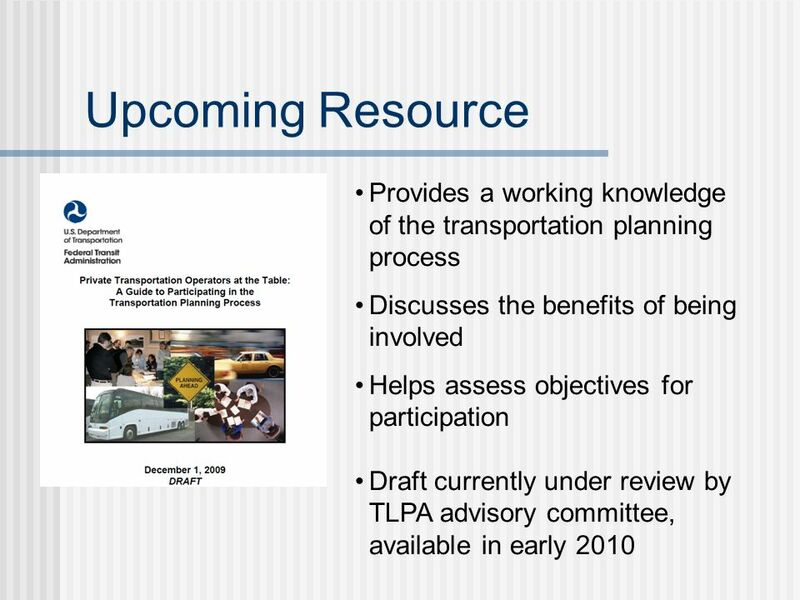 Transportation Planning for Federal Land Management Agencies (FLMAs) SAFETEA-LU Training Webcast April 2006 SAFETEA-LU Training Webcast April 2006. 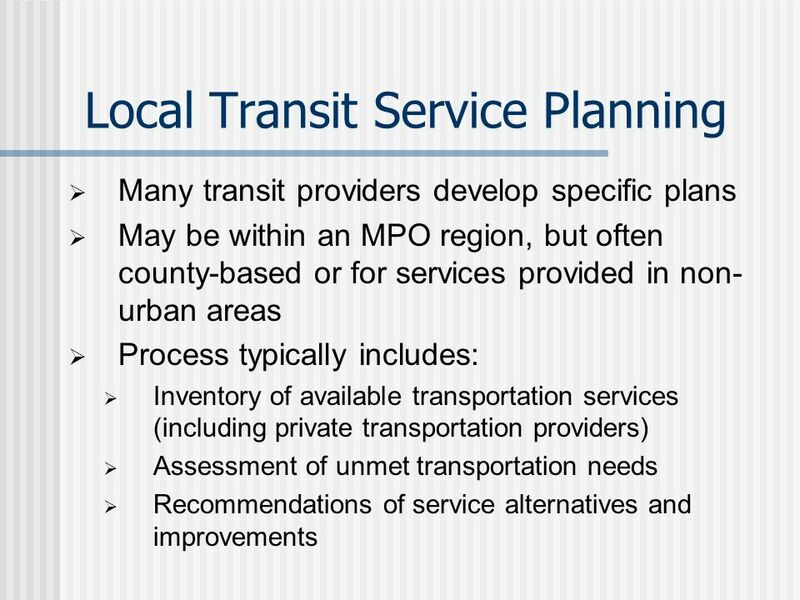 Regional Rural Transit Strategy Prepared for: Kern Council of Governments Prepared by: Nelson Nygaard Consulting Associates August 2003. 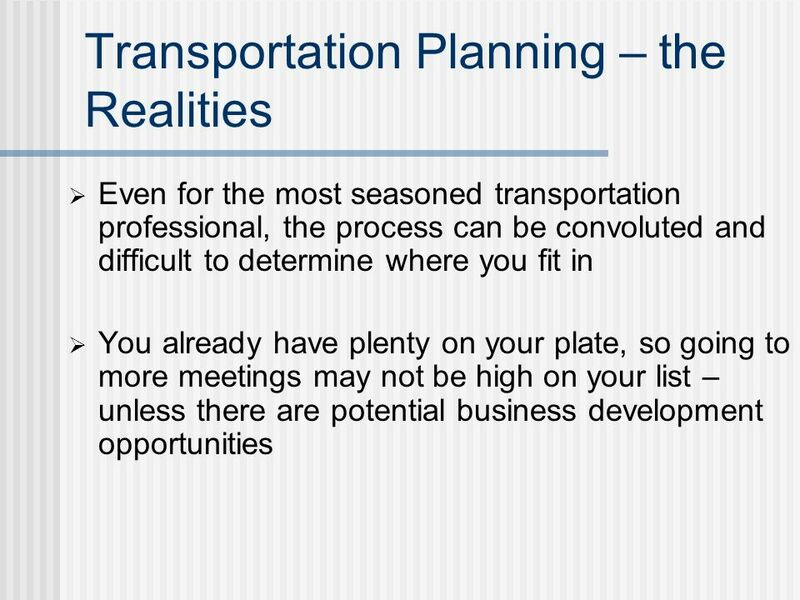 “East Texas Regional Transit Coordination Plan” Mark W. Sweeney, AICP Director of Regional Development and Services, ETCOG. 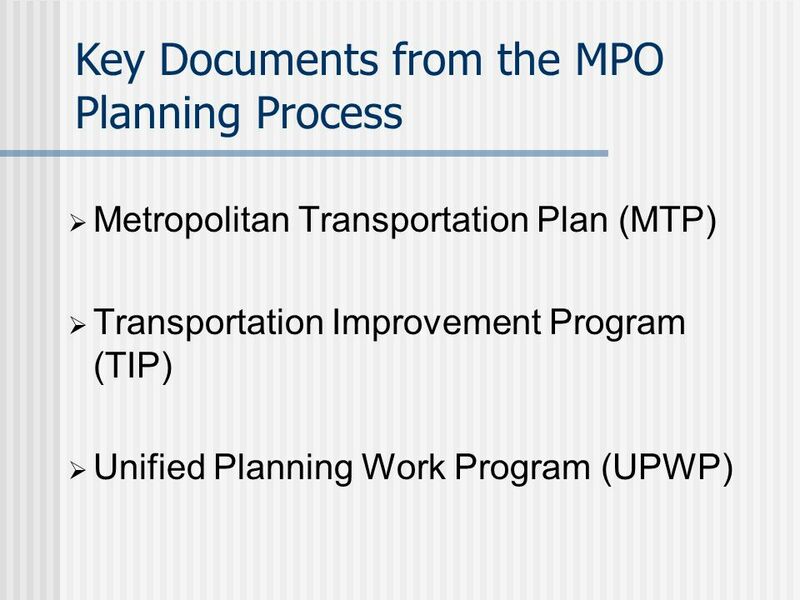 Wade E. Kline, AICP Community Development Planner. 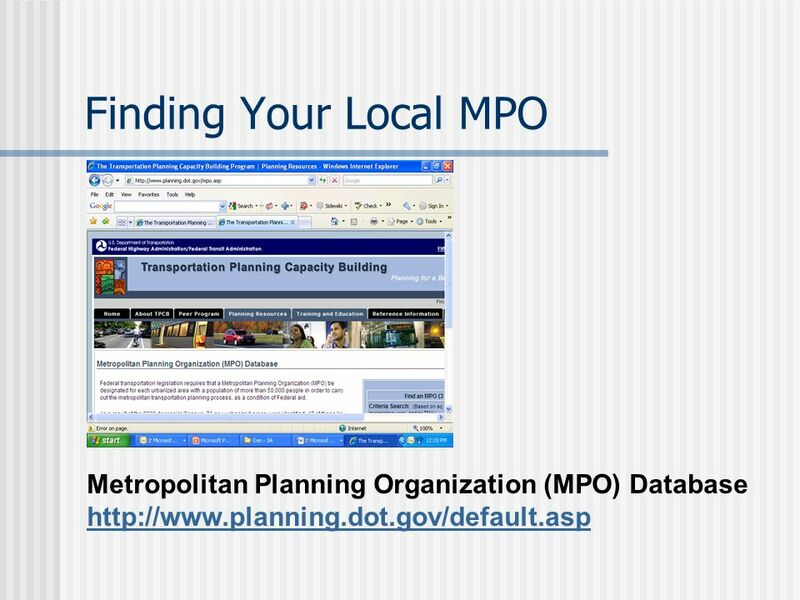 1 How to Succeed in Statewide and MPO Transportation Planning. 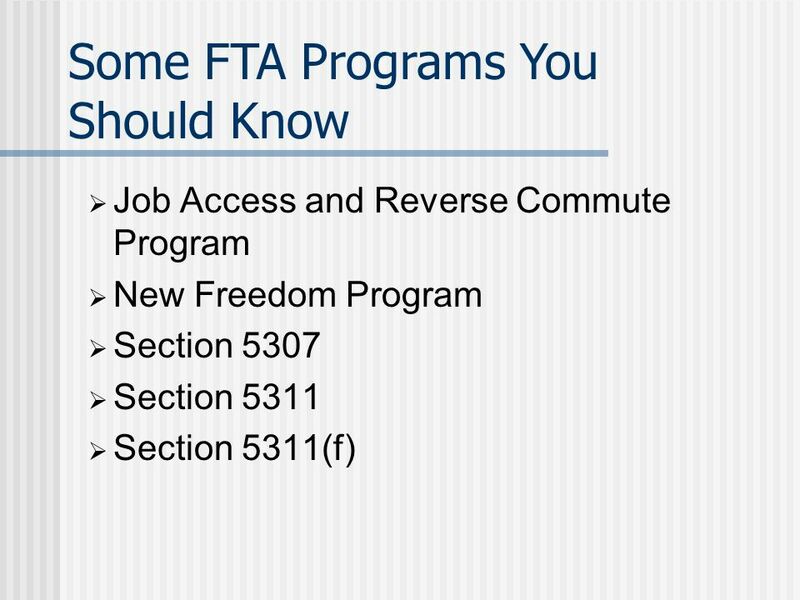 Public Transit Division Discretionary Grant Programs. 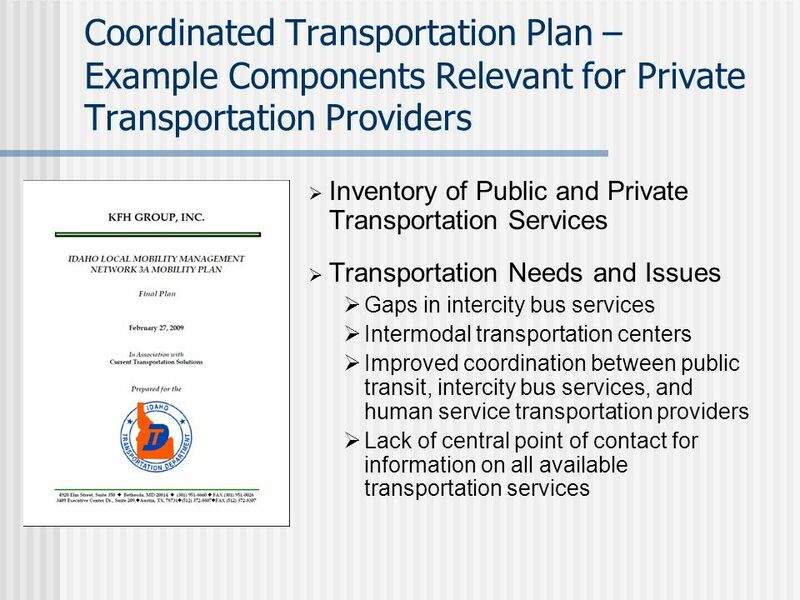 The Wisconsin Way Inventing Coordination Through Creativity, Flexibility, and Risk-Taking Bobbie Beson-Crone Human Services Transportation Coordination. 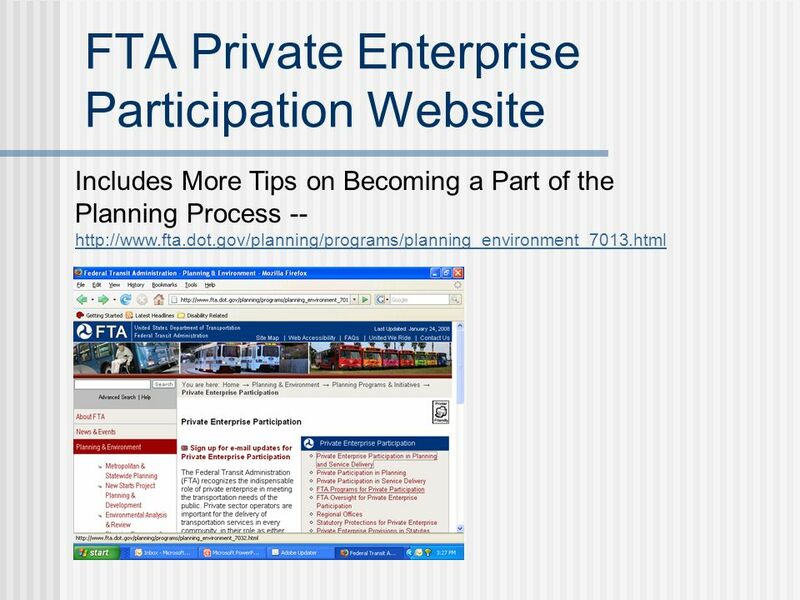 1 Federal Transit Programs Federal Transit Administration Jennifer Stewart FTA Region 8 November 9, 2007. 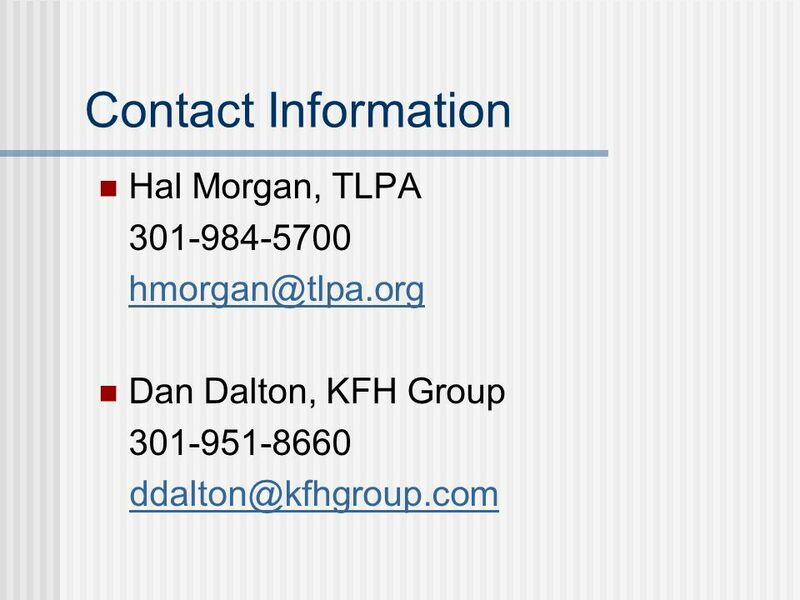 The Planning Perspective Presented by Joel Eisenfeld – KFH Group. 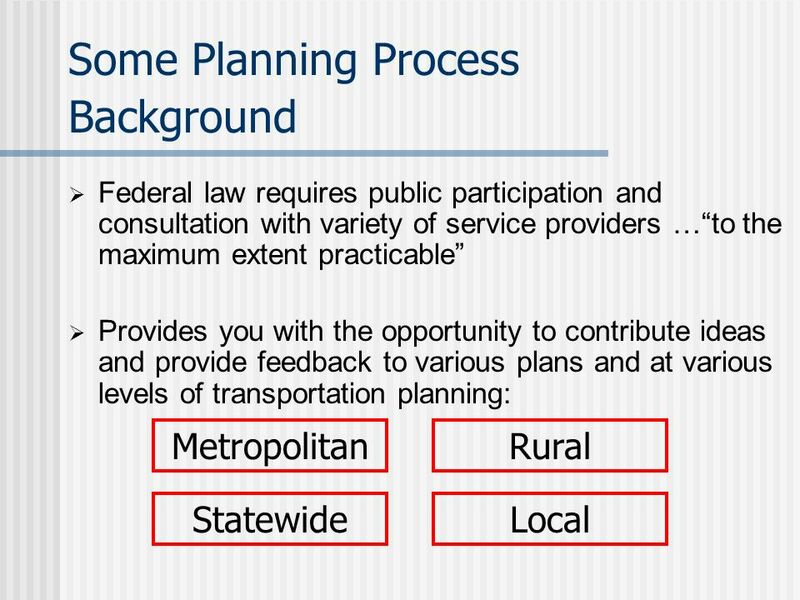 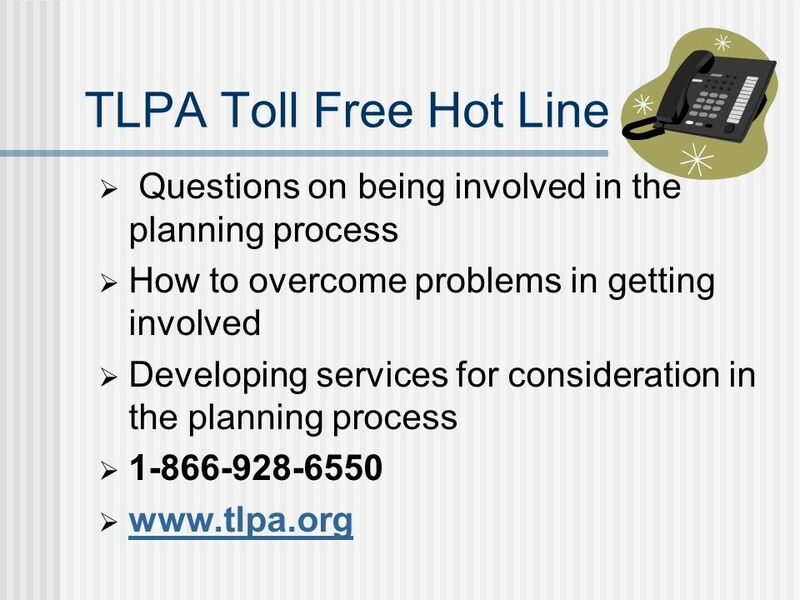 Metropolitan Transportation Planning: Primer FHWA/FTA Transportation Planning Capacity Building Program.